Our Gold version 3.0 comes with a new filter that allows you to find and manage your all protected files quickly and efficiently. There might be a lot of files on your WordPress media library. So it’s tricky to know which files are protected and locate them quickly. Our filter will help you resolve this management problem by just a single click. You can now find your protected files within a matter of seconds. Step 1: Go to “Media” and choose List View. Step 2: Our new filter appears on the right side of WordPress default filters. You can now filter your media files by their protection status: protected or unprotected. 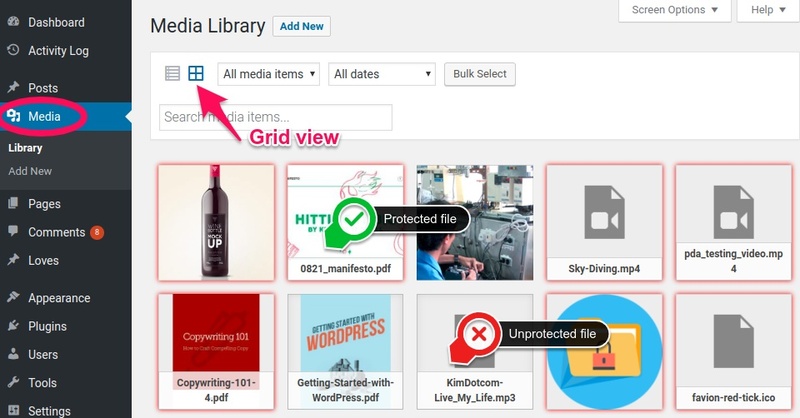 Since our Gold version 3.0, you can easily recognize protected files by a red shadow in Media Library Grid View or Add Media popup. This helps prevent your writers and editors from accidentally publishing private protected files.